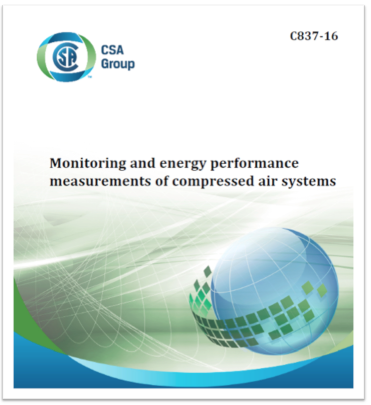 After almost three and a half years of development work the Canadian Standards Association C837-16 document “Monitoring and Energy Performance of Compressed Air Systems” has finally been published and is available for download. The work in writing the document was done by a CSA Technical Subcommittee made up of personnel from power utilities and government organizations, compressed air manufacturers and end users from both USA and Canada, with the committee activities facilitated and coordinated by the CSA Group (see list of committee members). The project was started and championed by Quebec Hydro, a Canadian power utility as a result of challenges being faced in the compressed air industry with regard to performance measurement. Problems were being encountered with inconsistency of reporting of system energy readings. The utility requested CSA Technical Committee T402 (Technical Committee on Industrial Equipment) to initiate work to solve these challenges. Therefore, a new subcommittee was created to work on a standard starting in the Fall of 2012. “Historically, there has been a lack of consistency in the methods used to determine the energy performance of compressed air systems. This often makes it difficult for stakeholders to make informed decisions concerning energy efficiency. This lack of consistent information complicates the task of ensuring any existing, new, or optimized system is operating efficiently. This Standard specifies which information is to be gathered and how system parameters like power, energy, flow, pressure, and production output are to be measured or calculated using transparent, uniform, validated, repeatable, and consistent methods of measurement. d) industrial and commercial applications of compressed air. The standard has a list of reference publications for the guidance of the reader and provides definitions used to clarify important terms and phrases mentioned in the body of the work. General explanation of how to measure and quantify Energy Performance by defining Indicators (EnPIs) and Energy Baselines (EnBs) pertaining to compressed air systems are described (Figure 1). A process flow is defined (Figure 2) to guide the reader in the general steps to take to perform the required measurements, calculations and comparisons. Key to the process is creating an energy baseline as a starting point to be used to compare subsequent measurement periods in which the system may have changed. Changes to the energy performance indicators can, for example, show changes to the system as a result of energy efficiency projects. These measurements can be used by the user, perhaps a power utility energy program or a plant manager, to quantify the improvement to the energy performance of the system. This might feed into the overall performance totals of an energy program. Important to this process is the ongoing continuous consistent measurement and comparison of the system to ensure energy savings are sustained and that the system is operating normally. Figure 1: The standard defines a number of Energy Performance Indicators (EnPI’s) and guides the reader how to compare a specified baseline period with any reporting period (Source CSA C837-16). Figure 2: The standard provides definitions and recommended actions on how to determine an energy baseline. (Source CSA C837-16). With any measurement there must be a defined measurement boundary so the energy baseline and additional measurement periods can be apples-to-apples comparisons. In any complex system there are a number of choices for measurement, often these are dictated by what is physically possible or economical to undertake. Once the boundary is defined all the energy inputs are identified for measurement, as well as the compressed air outputs. Some static factors are identified that are important to the measurement process but do not routinely change over time. These could be product type in an industrial plant, the number of shifts per day, the floor area of the plant, the typical system pressure and other factors. Some conditions are identified that might change these static factors into relevant variables, such as changing the operating hours of a plant. Guidance is given to the reader in determining a suitable baseline and reporting periods for the comparison process. General discussion is included about the data collection, such as how to measure, data collection frequency, data quality, and the calculation and comparison of energy baselines. Some discussion is given to normalizing the data, this would be necessary if something has changed between the time the baseline has been captured and the recent measurements are done. For example, a factory might change their production process and/or start a third shift. In this case the energy performance indicators might need to be normalized (adjusted) for a fair comparison. The standard recognizes the fact that the size of the system and the comparison of the total system energy consumption to the total facility consumption might determine the complexity of the methods used to measure and calculate EnPIs. Thus simple and inexpensive Level 1 measurement methods might be used for small systems that make up a small percentage of the total load. If a system is large and consumes a significant portion of the total load then it may be worthwhile to fully instrument the system and continuously monitor the EnPIs with Level 3 accuracy. Figure 3: For this sample system a number of system boundaries could be selected depending on the needs of the user (Source CSA C837-16). These energy performance indicators are dependent on system pressure, therefore the standard dictates pressure should always be measured at the same time. Figure 4: Conceptualized diagram of what a continuous monitoring system could report f or a compressed air system (Source CSA C837-16). The standard recognizes that measuring these parameters is sometimes costly and impractical, especially if the system is a small part of the total plant load, so three different measurement levels are identified. Level 1 might be the simplest spot check measurements, Level 2 more complex estimates based on defined more complicated measurement and calculation methods, or Level 3 more complex and expensive direct measurements of the parameters using accurate meters designed for that purpose. The standard discusses various ways of determining these parameters for guidance of the user, depending on the characteristics of their system and what is possible. Some examples might be calculating flow using a stopwatch test of a load/unload compressor at various intervals throughout the day, this might be at level 1 accuracy. The parameters might also be estimated based on the output of each system controller and the rated power and flow of the compressors, such as done when using runtime hour meters. Or actual flow meters and kWh meters might be installed either on a temporary basis or permanently to measure the parameters at Level 3. A discussion of various methods of measurement and calculation is provided in the standard. These include calculating three phase power consumption using amps, voltage and power factor estimates, and the adjustment of power factor for lightly loaded compressors. The use of data from system controllers is discussed and is allowed as a method of input for the calculations. The use of CAGI sheets for aid in estimating is also discussed. Some suggested system data collection of nameplate information and developing reports is discussed. At the end of the standard there are three fully illustrative examples of the three levels of measurement (L1 to L3) and calculation of the EnPIs for three different example systems for the guidance of the reader. It is hoped the standard will serve a useful purpose in the industry and help standardize the collection of data for reporting to energy programs and to customers considering implementing efficiency improvement projects. Already there is one example of the use of this standard in support of a new energy program at BC Hydro in Canada. As part of a new initiative large customers with systems 1,000 hp and up may be 100 percent funded at levels up to $40,000 if they perform system baseline monitoring, have an energy audit done on their systems, and initiate low cost/no cost energy measures. Key to this program is the installation of permanent monitoring that conforms to CSA C837-16. It is hoped that more organizations will adopt this standard for guidance of energy performance measurement of compressed air systems. The chairman of the Committee thanks all participants for their most valuable contributions and the considerable time spent on this standard development. The standard is available at the CSA Group website at www.csagroup.com. To read more Compressed Air Standards articles, please visit http://www.airbestpractices.com/standards.